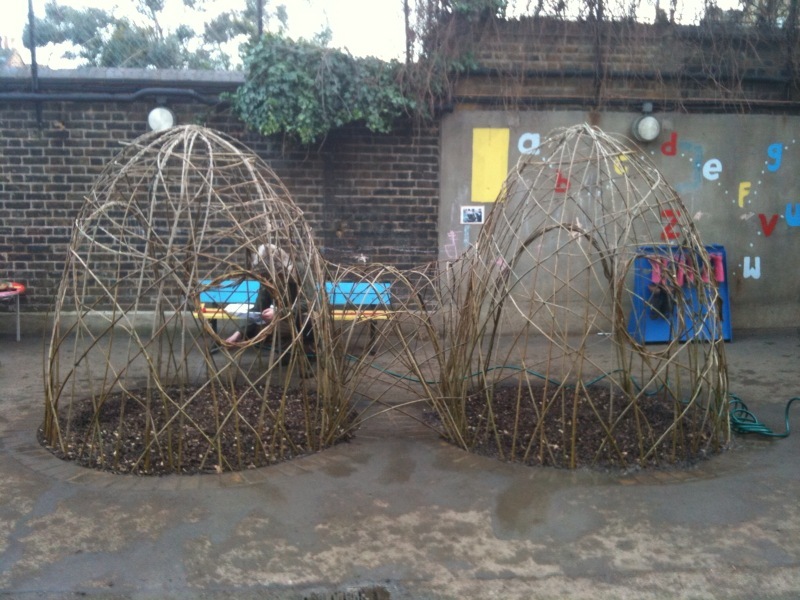 how much they enjoyed building their living willow structures and then using them. 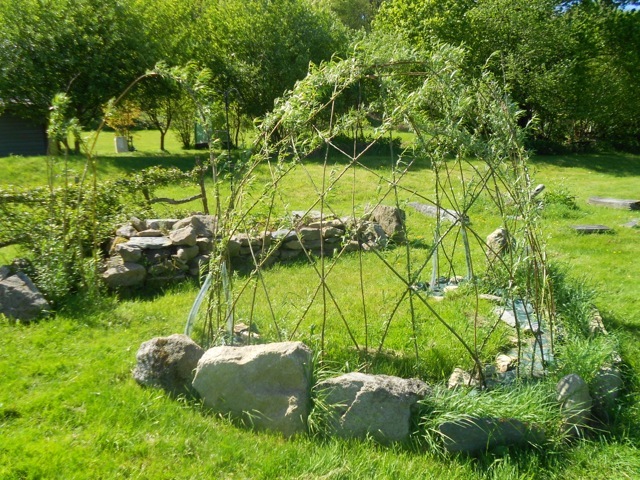 Some have even sent photographs of their willow structures and have kindly given their permission for us to show them. 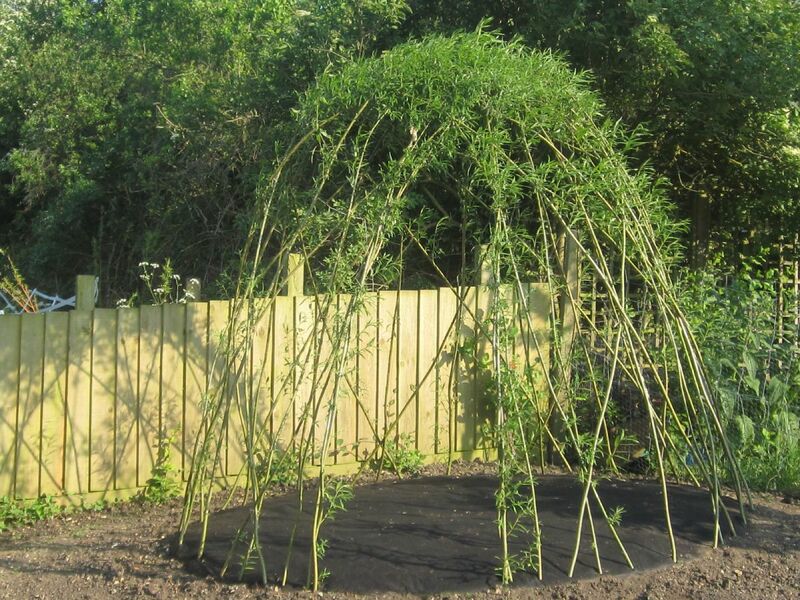 We thought it might be helpful for you to see willow growing in ‘normal’ garden and school settings. 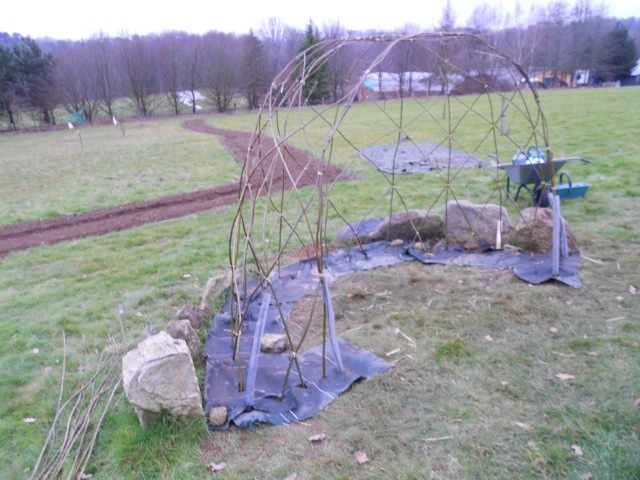 This is Liz’s Living Willow Arbour in mid construction. them to her home in France. after growth started in the Spring. 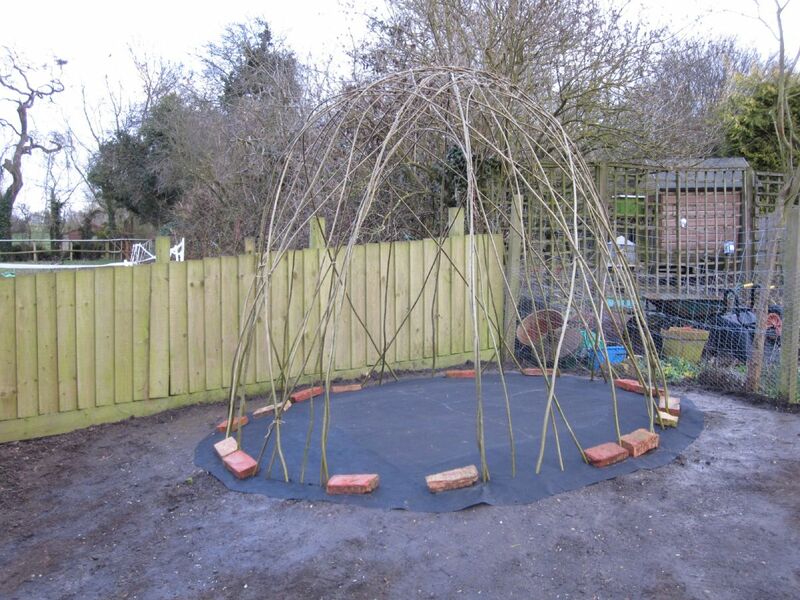 This photograph shows how Cassie Liversidge, Paul the Gardener and the children at Chisenhale Primary School in London have put two of our ‘Adapted’ Dome Kits plus some extra whips to an imaginative use in the limited planting space of their playground. 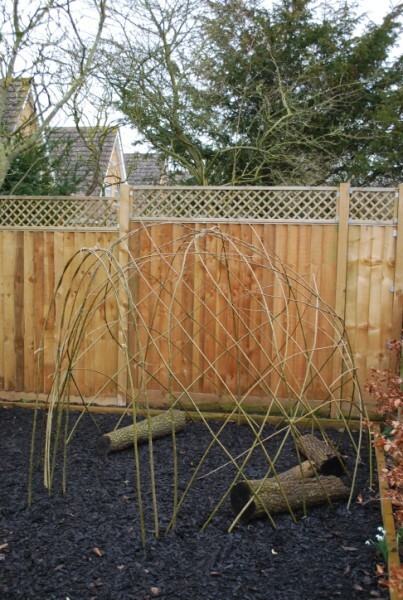 These fantastic mature willow structures were initially created by Peter and Zetta in 2004 from willow collected from our nursery. 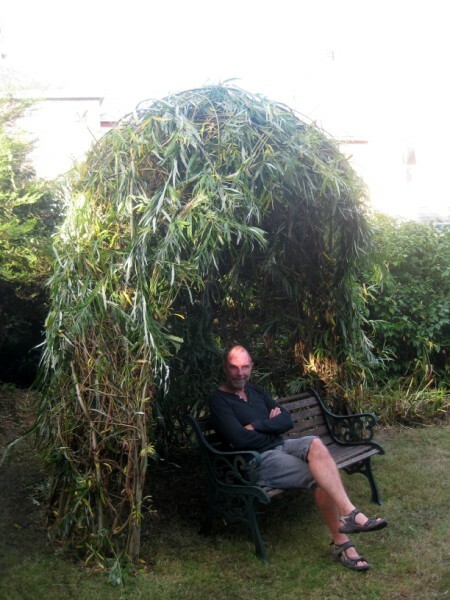 They kindly, more recently, got back in touch to say how happy they are with their willow and to send these current photographs (April 2011). 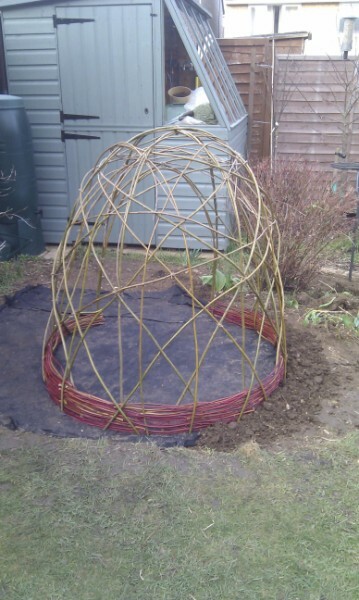 Caryl near Rushden Northants planted one of our Dome kits. 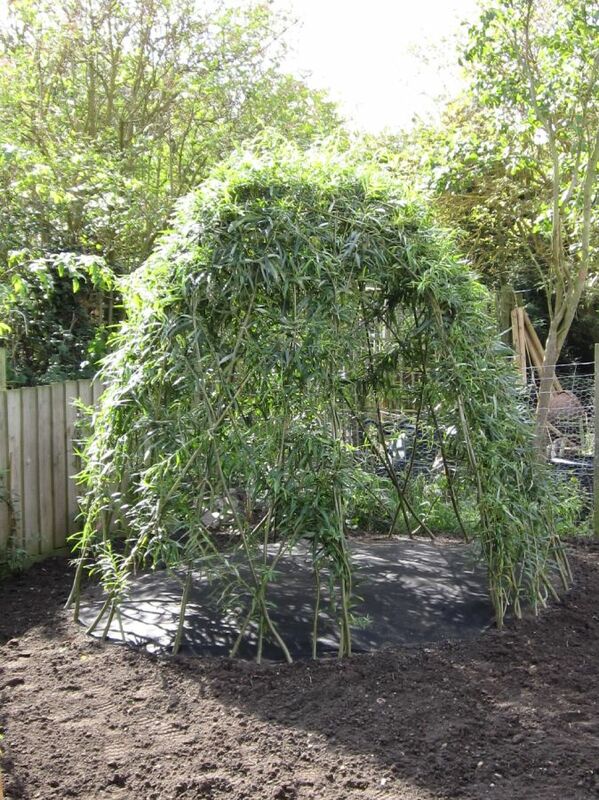 The photographs show the structure as planted in early March, with good growth in May and then in the August, with some of the growing season still to go, and new growth woven in. 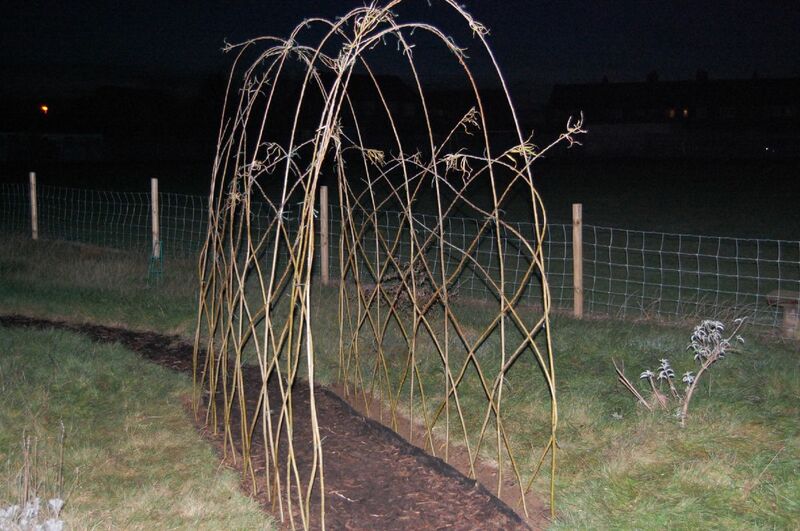 Above is a photograph of a Half Bower made by John in Scarborough using our kit. Below is his view from it !!!! 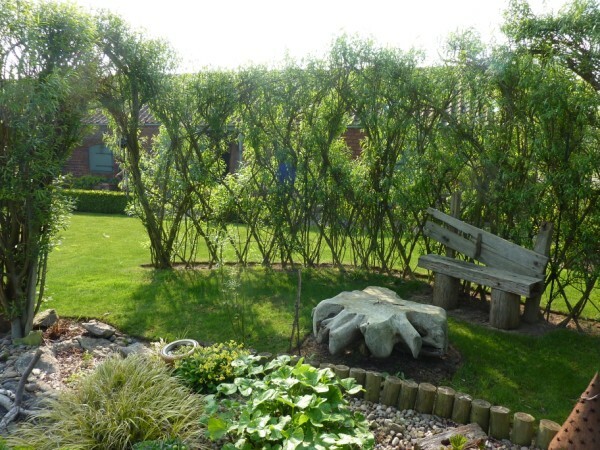 structure to their own design, as shown in the photograph below, a few weeks after planting. by Sarah Scott and children at Winteringham Primary School. 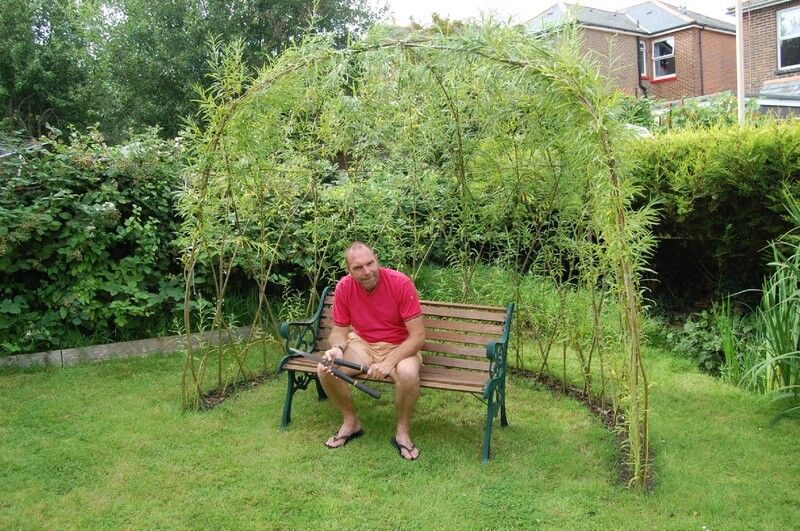 Robert wanted to create a low fedge/screen with a simple archway in planters. 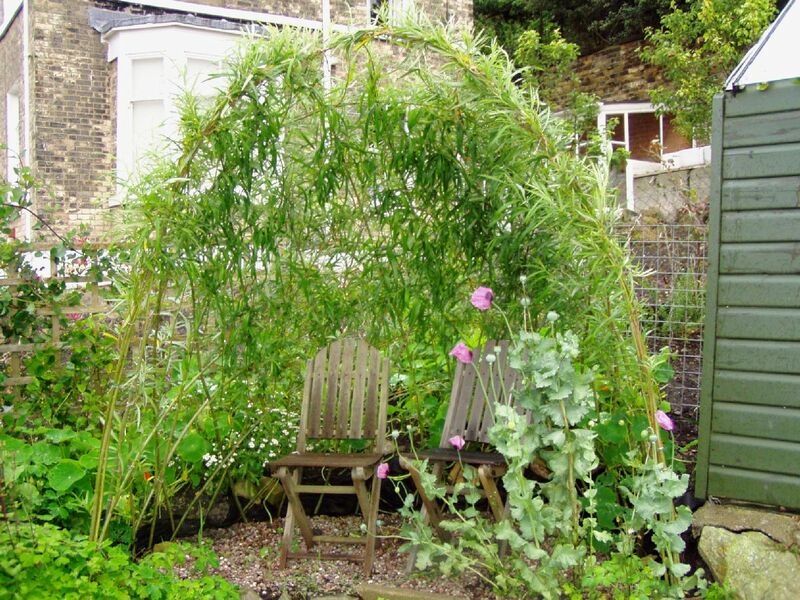 As we discussed with him, planting willow in planters or tubs is not ideal, but he was prepared to give it a try and collected a Fedge A Kit and some 11 ft long whips from us. 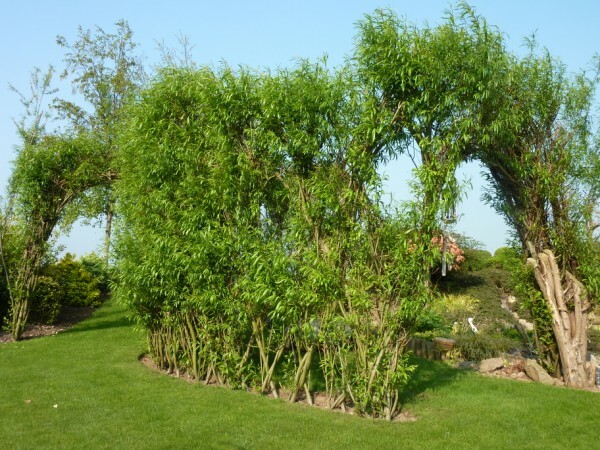 He knows that he will need to keep it well watered and fed – and adding a mulch covering will help with water retention later on – and that the growth will not be as vigorous as if it was planted in the ground. 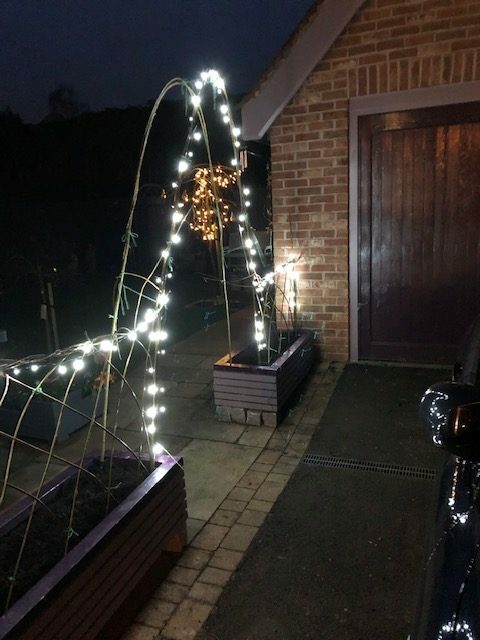 He collected and planted in early December – hence the lights for Christmas ! – and it looks great ! 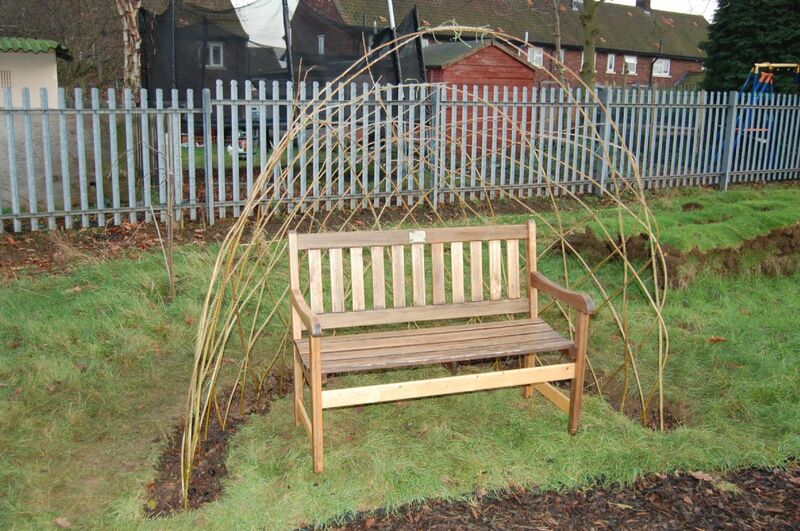 and would like to share what you have built, we would be very pleased to see your photographs.